Jwala Gutta and Ashwini Ponappa suffered a disappointing defeat against Setyana Mapasa and Gronya Somerville in the women's doubles match of the New Zealand Open. 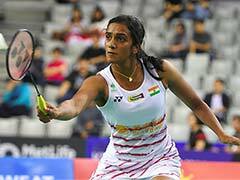 The 2011 World Championship bronze-medallists, Jwala and Ashwini, gave a tough fight in the opening game but ran out of steam in the second to go down 22-24, 8-21 to the local combo of Setyana Mapasa and Gronya Somerville in the women's doubles competition. In men's doubles, sixth seeds Manu Attri and B Sumeeth Reddy, who had won the Mexico Open last December, lost 10-21, 20-22 to second seeded Korean pair of Ko Sung Hyun and Shin Baek Cheol here. Shin Baek Cheol also paired up with Chae Yoo Jung to defeat Indian mixed doubles combo of Pranaav Jerry Chopra and N Sikki Reddy 21-14, 21-18 in another quarterfinal match.